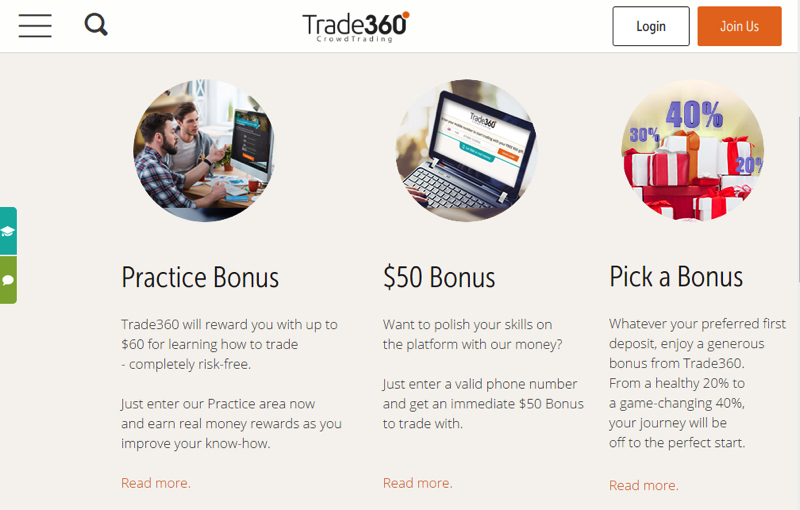 Trade360 Review | Find out if it is your perfect social trading platform! Similar to other Crowd trading brokers, the Trade360 forex broker allows you to hone your trading skills without any risk at all by using a practice account. One of the perks of this is that you also have the ability to earn a $60 bonus with this practice account. That $60 can then be used when you open your live account. The registration for the live account is pretty simple as well, you can use your Google or Facebook account to register and upon registration, you can earn a welcome bonus. This bonus ranges from 20-40% and is decided by your initial deposit. The minimum deposit is $50. Bonuses ranging from $50 – $99 attract a 20% bonus; $100-$199 attracts 30% and bonuses from $200 and up attract a 40% bonus. Another the plus of opening an account with the Trade360 broker is the chance to earn another $50 bonus which you’ll receive when you verify your phone number. It is all fairly quick and simple. The Trade360 broker’s trading platform is available in both online and on Android and iOS. All three versions of the platform are easy to understand and make trading simple and effective no matter where you are. 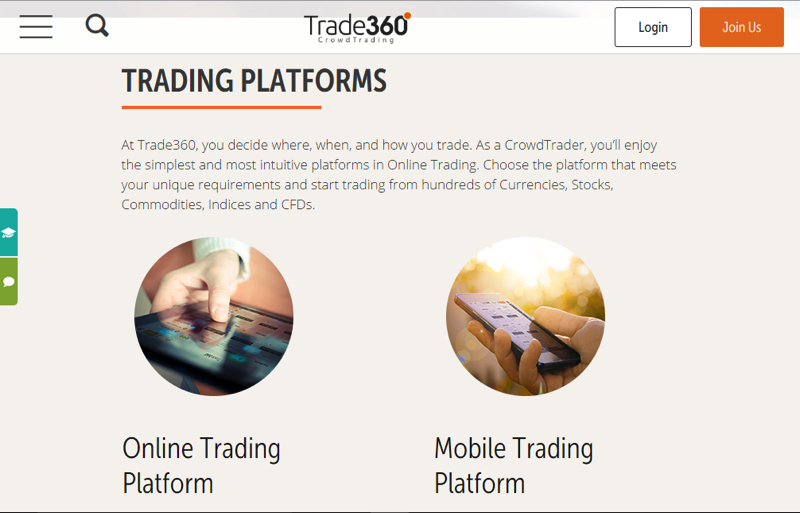 The Trade360’s opinion is that the crowd knows what it is doing and so the Online Trading Platform provides you with a user-friendly and intuitive customizable interface as well as a Live Feed that shows you the crowd’s behaviors and allows you to make more informed decisions regarding your trades. Another plus is that the online platform requires no downloads and can be used on any computer once you have a good internet connection. Their mobile apps are also quite praiseworthy with excellent content streaming and desktop quality tools, they make you feel like you are not away from your computer at all. While there is not the social platform for communication with other traders, the Trade360 broker’s Live Feed, as mentioned before, is displayed on the right of the screen and shows you Crowd created events and the crowd’s behaviors that you can factor into your trading decisions. 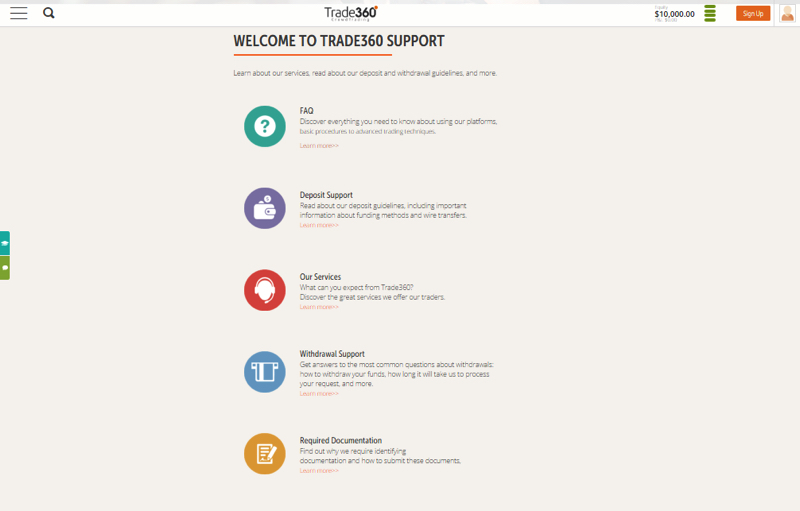 The Trade360 broker offers a comprehensive support system which consists of email, live chat telephone and fax. On top of that, their address is also listed on their website in case you wish to visit them but we doubt you would ever need to. Their Help center which contains both a frequently asked questions (FAQ) section, Deposit Support section, Withdrawal Support section, Services section and information on documentation. Their help center overall proved to be extremely helpful with answers to all of our inquiries being displayed in clear and easy to understand writing. An added bonus is that their website can be viewed in any language you choose and their live chat support is bilingual which makes it easy for near anyone to get the help and information they need. Fortunately, the Trade360 forex broker does not charge withdrawal fees. However, you can only withdraw funds using the payment method you deposited your funds with so if you used a wire transfer to deposit your funds then you need to withdraw your funds the same way. The time for withdrawal ranges from 3-10 days and is dependent upon the method chosen.